Street style: do people look good to you, on the streets? Who looks good in music? So everything’s a giant swizz ’cause everyone can get hold of everything? Chris: That’s the problem with society in general. Everything’s too readily available. There’s no underground anymore. There’s no elite! That’s what the Pet Shop Boys are all about, for God’s sake, elitism. ANd you can’t find it anymore. Someone brings out a great underground tune, it’s on Radio 1 the next day, it’s ruined! Life has just been ruined by it all! You have it in for career-pop, don’t you? Chris: The public. Hahaha! I dono’t know, it must be what we all want. Musn’t it really? It’s the whole culture. That’s used to this now, that’s used to being sold it all, used to accepting it. It can’t go on like this forever, can it? That’s why we’re hoping for the world to end, isn’t it? We’re accelerating to a point which must end in oblivion, so that something new can emerge. Do you think anything’s any good? Do you adhere to Tony Wilson’s ’13 Year Rule’ and The Revolution is on for this year? How about Fischerspooner? Electro-rock, features a loud bisexual man in tons of make-up ? Eminem’s film is coming out this year. Excited about that? Crap pop on one side, potential nuclear war on the other. How do you stop from losing faith in the human race? 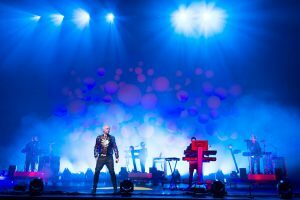 What will be the Pet Shop Boys legacy? Chris: I would want it to be that we’ve written some great songs that meant something to people. We’ve got fans around the world. Not like these manufactured pop acts. They’re only popular in England. It’s so parochial! Does hate, as someone once said, keep a man alive? Chris: D’you know what? I think I’ll have that on my tombstone: ‘Hate Kept Him Alive’. Nyeheheh!